I’m a big fan of choosing One Little Word (OLW) each year, to help me stay motivated, focused and driven towards reaching goals that I’ve set for myself… however small or big they may be. 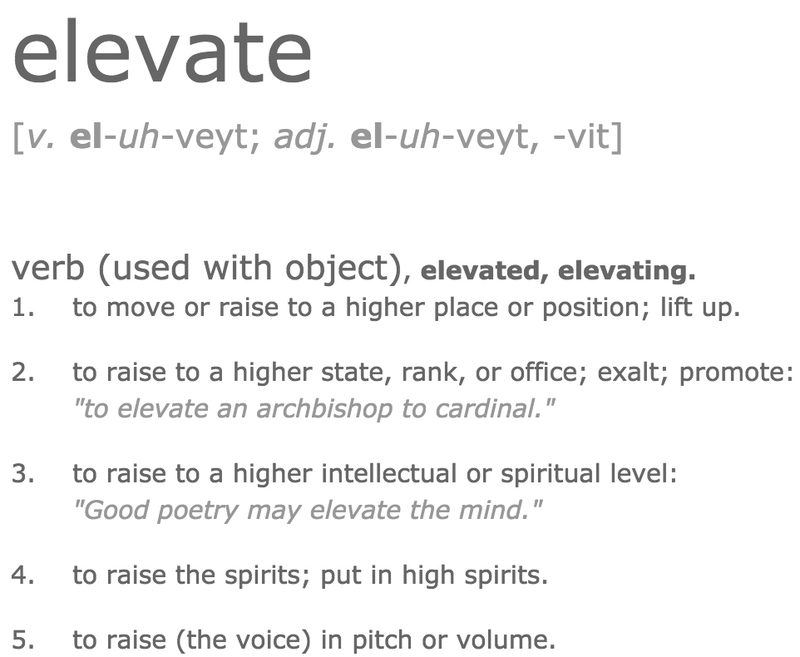 After a LOT of thought, this year, my word is ELEVATE. The amount of love, healthy energy and positivity in my life has tripled the past year… but not without a few huge hurdles in my way to jump over. I want 2015’s good vibes to be on a whole new level! Moments and friendships filled with ONLY genuine happiness, sincerity, confidence and optimism!!! Whenever I feel myself going to a place where I want to make justifications for not doing something, or find myself slipping into sedentary, motionless, negative or idle ways… I’m just going to get UP! Lift myself up to a higher place (emotionally or physically). Put my thoughts into a better, higher state of mind. I've gained about 40 lbs back from where I was when I was REALLY happy with myself in my weight loss journey. Yes... I'm hiding it well. Yes... I said I'd never go back once I lost it. and YES... I'm going to RISE above the feelings of disappointment, annoyance, anger and frustration, and start again. ELEVATE myself above all the negativity that I feel towards this freakin' obnoxious trial in my life, that yet AGAIN I have to tackle head on. Rise above the excuses of falling off the wagon, because of moving to a new house, starting a different job, and a husband having back surgery. Im ready to not just LOOK happy on the outside through a silly, well-staged Instagram or blog post... but to actually FEEL happy and content on the inside too! Because I know that once your confidence level about how you feel and look rises above what you wish it could be... you can be a SERIOUSLY happier person!!! Okay, so enough about me. What's YOUR One Little Word for 2015? What a perfect word for this year. Thank you for being so real. Mine is "now." As in right now, do it now, live now, be happy....now! I need to work on that "Now" as well! I'm trying harder, but it's definitely the PERFECT word for someone like me who's super busy and always has a million things on my plate. I hope that you can embrace that word and you can reach all your goals with it! Well you know what, I chose Gratitude, because last year I began reading the book, One Thousand Gifts. It's about finding God's full grace, true happiness, and a fulfilled life by counting all of His gifts to us, big and small. Living a life of true gratitude. BUT... I feel like maybe I should have chosen Elevate, too! I could have written your post word for word! I feel like I am after the same things you are and have been facing the same hurdles that you listed. Regardless of how we get there, I pray that we both come out much better at the end of 2015 than we are today. Big hugs & best wishes! I have read your blog for many many years now. So much so, that I often find myself saying "oh look how the girls have grown" or "I love her new haircut" when I see your photos, as if we are true friends. Haha! :) I just wanted to say that I love your word this year! It is a word that feels empowering and full of potential. My word for the year is "embrace". My family would like to embrace life together, embrace the needs of others, and embrace where we are and being thankful for this moment. My word was inspired by "embrace the body image movement". Taryn Brumfitt has a great project about body image that has helped my through my constant changing body and have a more positive view of myself. I really think you would like her website and documentary. If you get the chance google her and I know you will walk away feeling more positive about yourself and maybe having shed a few tears. Enough from me...this is becoming a blog post not a comment...sorry! I hope you and your beautiful family have a wonderful 2015! Best of luck on your word for the year, I love it! You're so so so nice! You made my day, thank you so much!!! And yes, we're all SO different, it's very true. I know that I just have to keep going, pushing forward and not get down... because everyone struggles with something! After several years of major surgeries for two of my kids who have Crohns Disease and two major surgeries for my Mother and losing my Father to cancer........this year........I'm choosing JOY!!!! Rather than going into overdrive mode and just handling everything. I want to stop and see the JOY in every situation, good or bad. In 2015...I"m choosing JOY! I LOVE that! Joy is the perfect word, especially because it sounds like you've been through a LOT this year! You deserve JOY! I love the idea of OLW, you are seriously such an inspiration!! We have been trying for a baby for about 4 years now. The only thing that the doctors can find wrong is my weight sooo that being said, 2015 is the year to get rid of the extra baggage and prepare this baby makin' body of mine! No more excuses for this girl. Can I steal your OLW, elevate? It really is the perfect word for me too! Thank you for always being so real and letting all of us have a peak into your lives! Aw, I hope and wish you the best with trying to get pregnant! I know that that can be a seriously rough road... but you sound like you're handling it like a champ! Wow, honesty is something you should be proud of- haven't picked a word yet but you inspire me to do it now! Shelley, where are you..... you hardly ever post any more and I miss you!